Authors: Kaius Karlsson, Jonas Tana, Outi Ahonen. 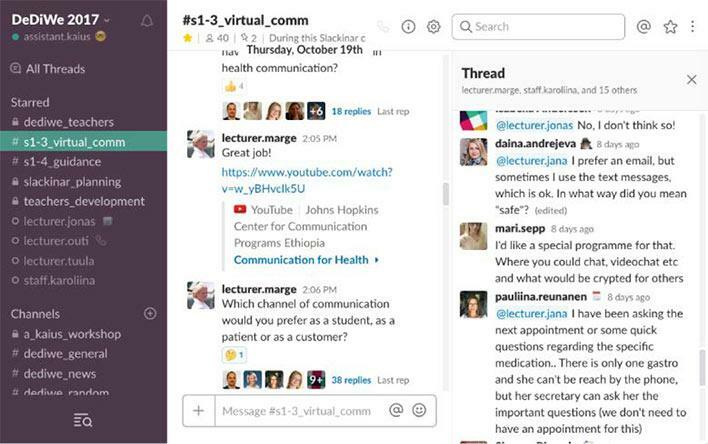 Image: A screenshot of a DeDiWe Slackinar in October 2017 delivered in Slack by lecturer Marge Mahla from Tartu Health Care College. The left-hand sidebar displays channels and workspace members. A Slackinar group chat channel is active in the center. The right-hand sidebar exhibits one of the channel’s several threaded discussions. Screenshot image by Kaius Karlsson. Starting next year, the Finnish Ministry of Education and Culture (2017) will channel 75 million euros into the development of university and UAS level education. Specifically, one target for funding is the enhancement of digital learning environments. Finland already holds a reputation as an education powerhouse (Arene 2016) and a digital pathfinder, so leadership in higher education online learning solutions should be a natural way forward. In our current delivery of the Developer of Digital Health and Welfare Services study module, or DeDiWe in short, we are experimenting with what we consider an example of a forward-thinking online learning solution. The DeDiWe study module brings together a diverse virtual learning community whose lecturers and students come from various professional orientations in several institutions, universities, and UASs in different countries. (Arcada 2017). DeDiWe’s pedagogic framework is based on the Learning by Developing Action Model, or LbD in short, which in itself is a Finnish education innovation dating back to 2002 when it was first used in Laurea (Pirnes 2008, 102). In LbD, lecturers, students, and professionals from working life partnerships collaborate in a shared learning environment. (Raij 2014, 14). The DeDiWe study module was piloted in 2016-2017. Feedback from students stirred an urge to modernize the study module’s delivery. In order to co-learn, co-design, and co-create eHealth service development in the DeDiWe study module, experts of nursing and welfare must join in collaboration with experts of software engineering and service design. For this, we looked for a platform that is accessible, communication-focused, and intuitive to use — a platform that could provide an equal playing field for our diverse community of students, lecturers, and participants from professional partnerships. From currently available online collaboration solutions, we picked Slack as the platform for the 2017-2018 curriculum. Slack is a professional virtual workspace service used by productive communities such as NASA, Harvard, and Oracle (Slack 2017). Originally, DeDiWe’s modernizer Kaius Karlsson utilized Slack throughout his studies in Laurea UAS. Typically, Karlsson set up a Slack workspace for his fellow students and himself when a new Learning by Developing group project started. Later, as a student in DeDiWe, Karlsson set up a Slack workspace for fellow DeDiWe students when the communication features of a traditional virtual learning environment were deemed insufficient. In traditional learning management systems, assignments, source materials, and interaction are usually arranged behind folders and tabs. Interestingly folders, tabs, and even email can be seen as virtualized relics from the age of paper and pen. 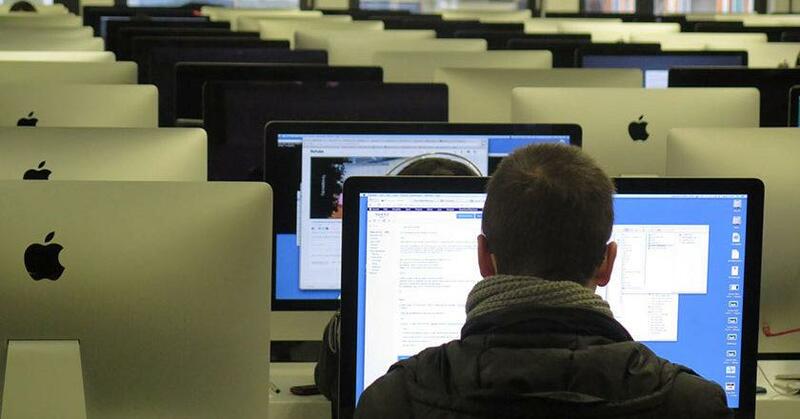 Their efficiency and productivity in online learning delivery can be questioned. Interestingly folders, tabs, and even email can be seen as virtualized relics from the age of paper and pen. Slack’s growing popularity (Forbes 2017) in itself can be regarded as part of a movement where users are looking for alternatives to traditional online collaboration and communication methods. On a platform like Slack, everything is based on chat. Instead of folders and tabs, files and documents shared in Slack are organized and rediscovered by taking advantage of features like pinning and favoriting. For example, an interesting comment or a shared PDF document can be pinned to a Slack channel for quick rediscovery for all the channel’s members. One can think of pinning in Slack as in pinning to a virtual bulletin board. Likewise, an individual member may favorite comments and contents and thus accumulate a personal list of bookmarks within the workspace. As part of the modernization, the study module’s content delivery and learning processes were rethought, simplified, and repackaged around what we call Slackinars — a term first coined by DeDiWe’s modernizer Kaius Karlsson in his 2017 blog post (Karlsson 2017). A Slackinar is perhaps best described as a chat-based seminar delivered in Slack. During a Slackinar, the transnational DeDiWe learning community lights up into a fervent two-hour group chat session where virtual contents are fluidly shared and commented on. Between Slackinars, students work in small groups on LbD assignments. The small groups have their own chat channels where their learning activity is focused on different development themes. 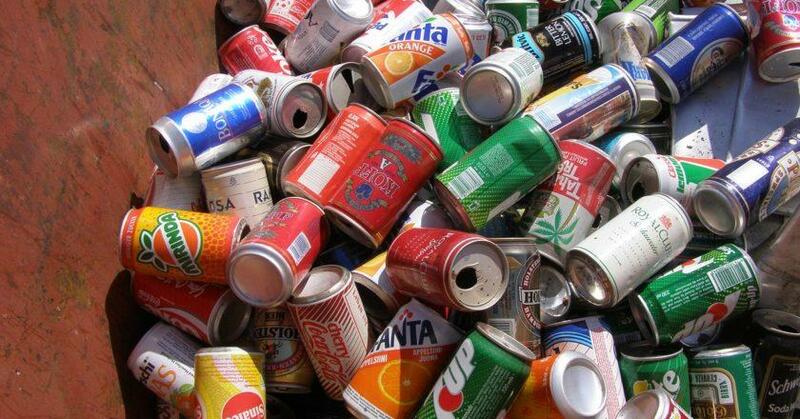 The development themes are based on professional interests expressed by students in an entry questionnaire. Figure 1. 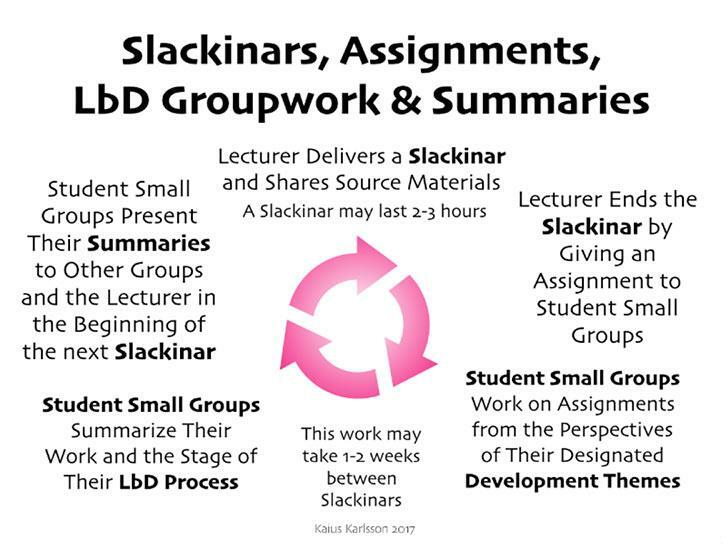 A visualization of the cyclical interplay of Slackinars, small group collaboration, summaries, and Learning by Developing of the DeDiWe study module in Slack. Each cycle is designed to propel the small groups’ creative development processes. It could be said that we are future-proofing our students by introducing them to a true working-life professional collaboration environment. We are building a virtual chat-based pedagogic foundation with an emphasis on dialogue, openness, and transparency — factors we consider imperative to innovation and collaboration. During recent Slackinars, we have enjoyed discussion threads populated with comments by dozens of students, some of them engaging in heated topic-related debates. According to a short survey conducted in October 2017, the DeDiWe students strongly agreed that Slack works well as a learning platform for the study module. Since all the interaction in our chat-based workspace is in text form, each piece of commentary and shared content is logged chronologically and is thus accessible for swift retrospection. The entire workspace can be searched by keywords, user names, time frames, and other search criteria. Ideally, the chat channels can be regarded as live communal learning journals that are accumulated and indexed for rediscovery throughout the curriculum. Ideally, the chat channels can be regarded as live communal learning journals that are accumulated and indexed for rediscovery throughout the curriculum. Specified searches in Slack are also a great way for lecturers to monitor student activity. Tutoring dialogues between a student and a lecturer can be conducted discreetly through direct messages. Voice or video calls can be initiated on impulse by clicking on a user’s name. The lecturers can maintain a private teachers’ room channel for planning and administration purposes. For example, the lecturers can have their own private group chats on things like evaluation and student attendance in a Slack channel that is completely inaccessible and invisible to students. Also, lecturers can collaborate for example on a study unit manual in private before sharing it to public channels where students can access it. The simplicity and openness of professional chat-based platforms means we can spontaneously invite new participants into our learning workspaces — guest lecturers, consultants, student interns, and professional partners that are essential to collaborative learning. A chat-based online communication culture may reduce the need for time sensitive telephone conversations and video conferences — not to mention actual traveling. By taking advantage of chat-based professional collaboration platforms, we can promote cost-effective, low-emission know-how mobility on a global scale while spending less time managing our email inboxes. Mihaly Csikszentmihalyi (1996, 1) has written that ”it is easier to enhance creativity by changing conditions in the environment than by trying to make people think more creatively”. Indeed, we believe the condition change of online education towards chat-based platforms can be a step towards enhanced creativity. We believe that the solutions we have now created for study module delivery through Slack are broadly applicable in the field of online education. These solutions are mostly compatible with other chat-based platforms like Microsoft Teams which has recently become available for use in the majority of Finnish universities of applied sciences. Microsoft Teams (Microsoft 2017), like Slack, is based on chat groups and can hence be used in similar fashion as Slack — students and chat-based group sessions can be assigned their own respective channels while the workspace as a whole can remain highly navigable and searchable. According to the Finnish Ministry of Education and Culture (2016), fresh approaches to education such as digital platforms require swiftness and agility from proponents of Finnish education exports. The motivation for fresh approaches is further emphasized when we consider the multi-disciplinary requirements of today’s rapidly evolving fields such as eHealth service development. With sufficient ambition and bravery we can conceptualize chat-based online learning solutions and export them internationally as pioneering Finnish education innovations. Csikszentmihalyi, M. (1996). Creativity – Flow and the Psychology of Discovery and Invention. HarperPerennial. HarperCollinsPublishers. Pirnes, H. (2008). LbD:n haasteet monikulttuurisessa oppimisympäristössä. Case: suomalais-japanilaisen vanhuspalvelumallin kehittäminen. In a Laurea Publication: Oppiminen Learning by Developing -toimintamallissa edited by Kallioinen, O. Laurea Publications A61. Vantaa.